Numerous former board members and trustees of a charity group cofounded by Bill Clinton have been accused of or convicted of insider trading, campaign finance violations, and other illegal schemes. The American India Foundation is one of several nonprofit groups in Bill Clinton’s charitable orbit, although it has received less attention than the Clinton Foundation and its spin-offs. The group was founded in 2001 "at the initiative of President Bill Clinton following a request from Prime Minister Vajpayee" in order to help with the recovery efforts after the Gujarat earthquake. It is currently run by CEO Ravi Kumar. AIF was co-founded by Clinton and former Goldman Sachs director Rajat Gupta in 2001. Clinton continues to serve as honorary chairman of the council of trustees, according to the website. 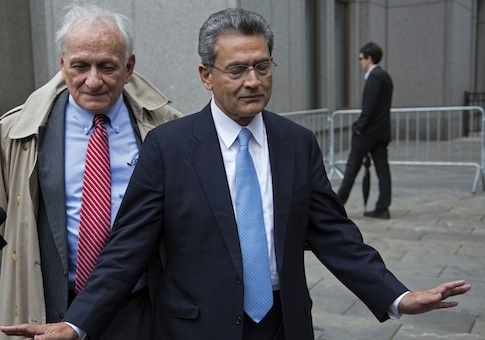 Gupta, a Clinton donor, was convicted of passing illegal trading tips to another former AIF trustee—Raj Rajarantam—in the highly-publicized 2011 case that took down the Galleon hedge fund. Gupta is currently serving out a two-year prison term and was last listed as co-chairman of the AIF board in 2010. Gupta’s legal team highlighted his work with AIF and Bill Clinton during his sentencing. "Rajat worked with former U.S. President Bill Clinton and Victor Menezes, former Senior Vice Chair of Citigroup, to found the American India Foundation (AIF)," said his attorneys in a sentencing memo. "Under their leadership, within its first year AIF raised millions of dollars to support earthquake relief efforts." However, Gupta is just one of many current or former members of AIF leadership who have been embroiled in headline-grabbing legal controversies over the years. Rajarantam, the former head of Galleon and also an early member of AIF leadership, was sentenced to 11 years in prison—the longest sentence ever handed down in an insider trading case—in 2011 for allegedly using illegal stock tips to amass a $63 million fortune. Former AIF trustee and hotelier Sant Chatwal, pled guilty in 2014 to a conspiracy to violate campaign finance laws. He was accused of illegally funneling $180,000 through straw donors to political candidates, including Hillary Clinton’s 2008 presidential campaign. Federal investigators reportedly recorded Chatwal talking to an informant about using contributions to influence politicians. "Without that nobody will even talk to you. When they are in need of money…the money you give then they are always for you," he said. "That's the only way to buy them, get into the system. … What, what else is there? That's the only thing." The Hampshire Hotels president was sentenced to three years probation and ordered to pay a $500,000 fine, according to his attorney. He is still listed as a New York trustee on the AIF website. Chatwal’s son, Manhattan socialite Vikram Chatwal, has also been an AIF trustee. He was charged with felony drug trafficking in 2013 after police say he tried to board a plane carrying heroin, cocaine and illegal prescription pills. The charges were dismissed after he completed a yearlong rehab program. Natel Engineering, a company owned by former AIF trustee Sudesh Arora, pleaded guilty to contract fraud in 1993. The company was ordered to pay a $1 million fine for neglecting to test computer parts in military equipment it sold to the U.S. military. InfoUSA founder Vinod Gupta, a former early AIF board member, was charged by the Securities and Exchange Commission with misappropriating company funds in 2010. According to a lawsuit filed by InfoUSA shareholders in 2006, Gupta spent company money on private flights for the Clintons. Bill Clinton also reportedly earned over $2 million working as a consultant for Gupta’s company. Gupta stepped down from InfoUSA and agreed to pay a $7.4 million settlement in 2010. Tech entrepreneur Naveen Jain, a former AIF trustee, was found to have violated insider trading laws in a civil suit in 2003 and ousted as CEO of InfoSpace. A current AIF trustee, CEO of Fairfax Financial Holdings Prem Watsa, is reportedly under a civil investigation in Canada for insider trading, along with others at the company. Fairfax said it is cooperating with the probe and denied any wrongdoing. The foundation has also honored Ramalinga Raju, the head of the now-defunct Satyam Computer Services, a company that has been dubbed "India’s Enron." Raju was sentenced to seven years in prison in April after he was convicted of carrying out one of the largest corporate frauds in India’s history. His sentence was suspended in May pending appeal. AIF did not respond to an emailed request for comment. A spokesperson for Bill Clinton was reached and did not comment. Attorneys for Vikram Chatwal, Arora, and Rajaratnam could not be reached. Sant Chatwal’s attorney confirmed the details of his sentencing; the others did not return requests for comment. AIF brought in $6.9 million in 2013, and spent just over $7 million, according to tax records. It currently has a two out of four star rating from Charity Navigator. The charity supports education initiatives, anti-poverty programs, and disaster relief efforts in India and says it has "chang[ed] the lives of more than 2.3 million of India’s less fortunate." Through its high-profile fundraising events, AIF has provided a networking platform for business leaders, Hollywood stars, and political figures. Earlier this month, the group honored Center for American Progress president Neera Tanden, a former Clinton aide, at a fundraising gala in Washington, D.C. This entry was posted in Politics and tagged Bill Clinton, Cronyism. Bookmark the permalink.